Patrick Dangerfield bursts away from a stoppage. 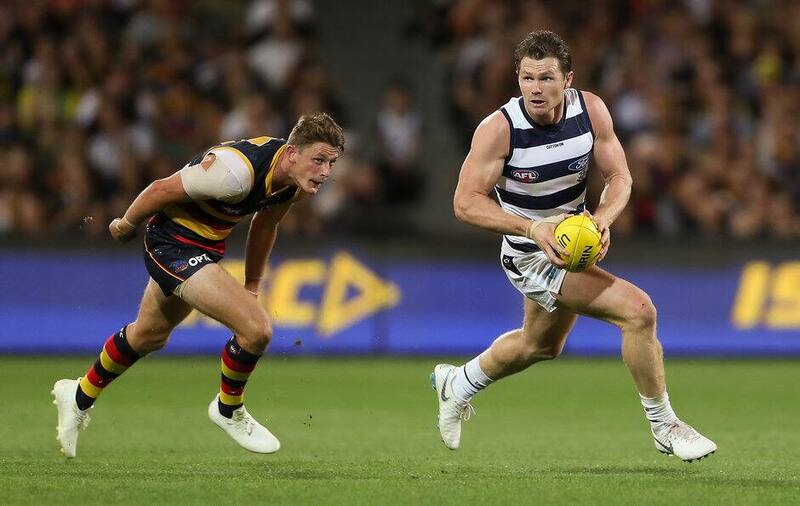 WHAT a season Patrick Dangerfield has had so far. The 29-year-old was on fire against his former team on Thursday night, finishing the game with 32 disposals, 10 contested possessions and a goal. Could a second Brownlow Medal be heading his way this year? The 2018 All-Australian collected 23 disposals to go with 10 rebound 50s and eight marks. Sheppard was important, as was Josh Walker for Brisbane, holding the backline together as Port Adelaide came hard at the Lions. Tom Stewart is putting together an excellent campaign and has been rewarded with his third selection. It was a bit cheeky to pick Lachie Whitfield at half-back considering he was a high half-forward but he's played plenty of football there and had to be named after a dominant performance against Richmond. Gold Coast's Sam Collins was outstanding in keeping the Western Bulldogs at bay and Fremantle's Luke Ryan stood out against St Kilda. It's no surprise that Michael Walters was sublime for the Dockers. The best way to respond to criticism is by being best afield, which Dyson Heppell was for Essendon. Gaff was great, while Brodie Grundy dominated the ruck battle for the opposition. There could be another Brownlow Medal going Patrick Dangerfield's way but Lions ball-magnet Lachie Neale would also be in the frame. A dodgy ankle has hampered Isaac Heeney this season but he was brilliant against Carlton. Jeremy Cameron snagged seven goals, Eric Hipwood burst out of his slump with six, Luke Breust and third-gamer Connor Rozee each had five while Cripps finished with four. Gold Coast has left football pundits embarrassed after posting its second straight victory and Jack Martin has been a big reason why. Anthony McDonald-Tipungwuti helped swing the game for the Bombers to finally win, while Patrick Cripps and Marcus Bontempelli were enormous in losing sides.